The second Swarovski trilogy is the “Mother and Child” series, all designed by Michael Stamey. 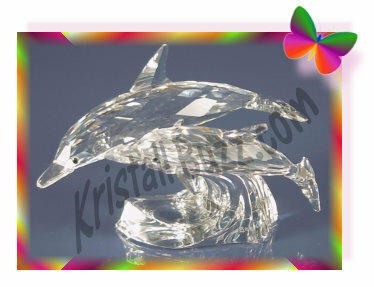 The first crystal figurine of the series is the Swarovski Dolphins, which are the feature figure of this article. The Swarovski Dolphins were available for purchase only in 1990 by collectors who had a membership in the Swarovski SCS Club. These ‘Mother and Child” Dolphins measures about 4 3/4” long. It is a figurine with 2 clear dolphins, a mother dolphin and a baby dolphin, swimming atop a clear wave. The ‘Lead Me’ Dolphins were known using the Swarovski part number DO1X901, and years later the system number 153 850 was revealed, so it can be identified using either number. It is not unusual for the non-collector owner (i.e. someone has inherited a collection but is not knowledgeable about Swarovski) to refer to the figurine as a ‘Swarovski Porpoise’ pair. In doing some research, I found that there are distinct differences between dolphins and porpoises. The crystal brand has not released any Swarovski porpoise figurines. The SCS Swarovski Dolphins retailed for $225 USD in 1990. The purchase price included the crystal figurine, a custom box for the figurine, and a Swarovski COA (certificate of authenticity). While the resale price of the Swarovski Dolphins surpassed to over $900 shortly after 2000, a mint condition figurine, complete with original packaging can generally be purchased on the secondary market for $450 – $475, from Swarovski expert dealers, like Crystal Exchange America.